I'm liking this coatcrack design from Desu Design, though I'm always inclined towards seeing it made of wood something rich and contrasting like oak/ maple and cherry/ mahogany). "During the coat-less summer months the Symbol hangs as a purely aesthetic piece, as the hooks lay flat and belie their function. 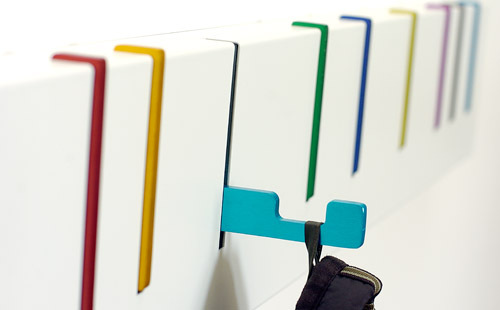 When needed, the hooks pull smoothly out to help you organize your stuff. 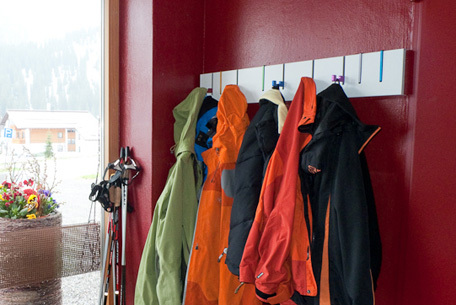 The Symbol Coat Rack is 1.5" deep with the hooks up, and 4.25" when the hooks are flipped down"
Love this coat rack design! it is great!